Barclays has opened the doors to Scotland’s first Eagle Lab, in Edinburgh, in partnership with CodeBase. The investment will provide a new space for businesses and communities to learn about innovative technologies and boost digital skills, while supporting job creation in the local economy. The tech-infused space is packed full of cutting-edge equipment for digital fabrication, 3D printing and laser cutting, providing businesses with access to the tools they need to rapidly produce and test prototypes without having to import them from overseas. Some of the entrepreneurial companies who will be using the facilities include Machines with Vision, whose localisation mapping technology can be used to position and guide self-driving vehicles, and Holixica, specialists in 3D visualisation technologies including digital holograms and holographic video displays. The lab is the 14th Eagle Lab launched by Barclays in the UK, following successful sites in locations including London, Liverpool, Cambridge and Cardiff. It will operate within the existing CodeBase business incubator and co-working facility, helping digitally empower Scottish businesses while supporting improved productivity and economic growth. 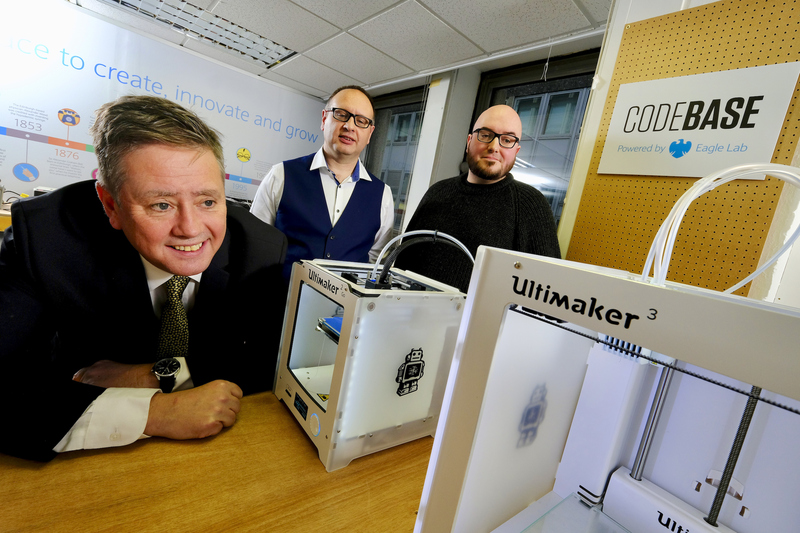 It will also offer resources including expert mentoring and workshops for Scotland’s start-up and scale-up businesses to complement CodeBase’s existing incubator services. Commenting on the news, Keith Brown MSP, Cabinet Secretary for Economy, Jobs and Fair Work, said: “This is a great new resource providing Scottish businesses with access to a range of experts, workshops and advice to help our workforces become equipped with the necessary skills to embrace the opportunities of digital technology. The new Eagle Lab is a significant milestone in the development of Barclays’ High Growth & Entrepreneur proposition in Scotland. It will help ambitious high-growth businesses during the scale-up journey, and members of the public and local community groups as they seek to improve their digital skills. Stuart Brown, Head of SME Scotland, Barclays, commented: “With Scotland focused on becoming a major digital player, it is vital our SMEs and entrepreneurs are equipped with the skills and tools they need to thrive in today’s ever-changing and dynamic economy. “Whether you’re an inventor, innovator or mentor, our Eagle Lab is the perfect space to digitally empower your business, supporting scale-up opportunities, collaboration and innovation. As the UK’s largest technology incubator, CodeBase Edinburgh is the centre of the tech scene in Scotland’s capital city. It is home to over 100 companies and already offers operator-led scale-up education, flexible office and co-working spaces, mentoring and networking events.